MB™ 543 is a very hydrophilic, water-soluble orange fluorescent dye. Structurally related to Alexa Fluor® 546 dye, MB™ 543 dye contains an additional, negatively charged sulfo group (SO3H) to improve water solubility and minimize self-quenching. 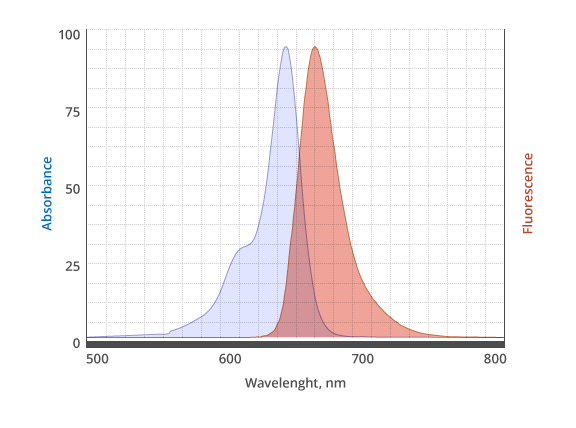 Characteristic features of MB™ 543 are strong absorption, high fluorescence quantum yield, high photostability, and pH insensitivity from pH 3 to pH 10. 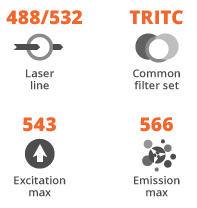 MB™ 543 is a highly suitable dye for single-molecule detection applications and high-resolution microscopy such as PALM, dSTORM, STED etc. The NHS Ester reacts specifically and efficiently with a primary amine (e.g., side chain of lysine residues or aminosilane-coated surfaces) at pH 7-9 to form a stable, covalent amide bond. The NHS ester (or succinimidyl ester) is the most popular tool for conjugating dyes to the primary amines of protein or antibody (Lys), amine-modified oligonucleotides, and other amine-containing molecules.